Come out on Saturday, April 23, from 9 AM – 12 noon and help to clean up our parks for spring! We need help picking up litter and preparing the parks for the coming season. 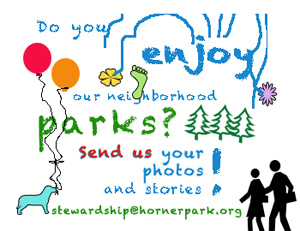 There is something to be done at Horner, Ravenswood Manor, Buffalo, Sunken Gardens and Jacob Parks, so all are invited to help steward our parks. Bring gloves, wheel barrows (for mulch), rakes, shovels, bags, and enthusiasm. 9am – Noon; Nice weather guaranteed.Horner Park features almost one hundred species of trees, the park district’s largest grove of preserved ash trees and one of the more ambitious riverfront restoration projects on the Chicago River. This Saturday, we’ll be mulching the trees along the eastern edge of the park. Join us at the field house at 9:00 am to get started. All tools will be provided; just bring some gloves. Please contact John at jf33@johnfriedmann.com or 312-719-1960 for more information.